Dark waters are rising. Who will stay afloat?Architect Vance Nolan has crafted a marvel -- shining apartments floating in the peaceful cove of a winding river. The project is partially occupied and about to make investors rich when a sinkhole gives way.Torrential rains quickly flood the cove, leaving a handful of builders, investors, and residents cut off from the rest of the world.The motley group is bitterly divided over how to survive.Vance insists they wait for rescue. Developer Tony Dean wants to strike out into the darkness. And single-mom Danielle Clement, obligated to each man and desperate to protect her young son, Simeon, isn't sure which one is wiser.Power failure, an unnatural daytime darkness, explosions, and a murder expose hidden intentions and dark histories. Then Simeon spots something strange underwater -- beautiful, shifting lights in the dark depths.In this watery world, everyone's secrets will eventually come to light. 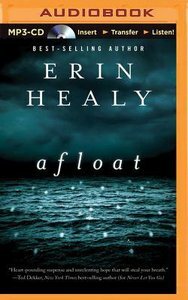 And deliverance may mean more than just getting out alive.Another stunning exploration of the human spirit and supernatural possibilities from bestselling author Erin Healy. Erin Healy is an award-winning editor who worked with Ted Dekker on more than a dozen of his stories before their collaboration on Kiss. She is owner of WordWright Editorial Services in Colorado. She and her husband, Tim, are proud parents of a preschooler.